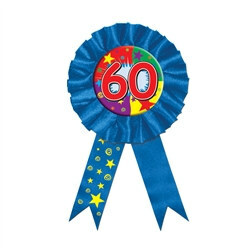 Celebrate life and your 60th birthday with this fun Blue 60 Rosette Award Ribbon. Dress the birthday boy or girl in honor with this Blue 60 Rosette Award Ribbon which measures 3.75 Inches x 6.5 Inches. This inexpensive party supply is made of bright blue material with fun bright colors surrounded by number 60 and yellow stars to add color to the award ribbon.